Bio: Born in 1956, this self-taught British artist paints in a number of media and genres, not only in pastel. I have included him in this directory because his pastels are so accomplished they cannot be ignored. Hanlon was influenced in his early years by Australian artist Raymond Harris Ching, who illustrated the Reader’s Digest Book of British Birds. I can identify with him as I bought a copy when it first came out, amazed at the lifelike treatment of the birds, so unlike the still museum poses of what had gone before. I still have it, and treasure it. Another of Hanlon’s influences is Andrew Hemingway, one of the world’s foremost pastel artists. His influence may be seen in some of Hanlon’s still life work. Hanlon has exhibited widely, in the UK, in Europe and in the USA, with one man shows and mixed exhibitions, including the World of Watercolours in London; Whaletail Exhibition in Nairobi, where he was an award winner; International Animal Exhibition in France; Nature in Art, Gloucester; The Tryon and Swann, London; and the prestigious Birds in Art exhibition in Wisconsin, America. Hanlon has been Artist in Residence at Wallsworth Hall, Gloucester and has taught art at Marlborough College Summer School. Hanlon also works on many commissions including designing cover jackets for and illustrating books (Gerald Durrell's Army and Conservation published in 1997). His commissions include Altarpiece, a 10 x 5 foot triptych inspired by a verse by St. Francis of Assisi, and a commission from the Jersey Wildlife Preservation Trust for a painting depicting endangered species to commemorate their 25th anniversary. His work was featured in Leisure Painter, December 2012. He is represented by the Wykeham Gallery, Stockbridge, Hampshire, and the Jerram Gallery, Sherborne, Dorset. Medium: Pastel; acrylic; oil; tempera; watercolour; sculpture. Style: Realism. Hanlon’s paintings are all his own, even if you can see glimpses of Hemingway, or Nicora Gangi. Publications: Birds and Beasts of Africa: Observations of a Wildlife Artist, Swan Hill Press, 1997. 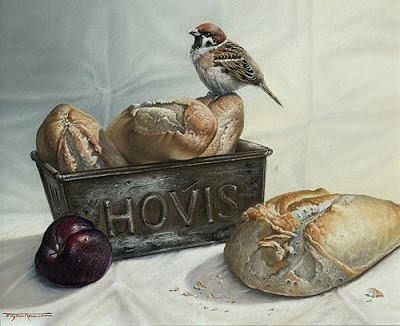 Gallery: Painting: Birds (no pastels); Mammals (one pastel); Landscapes (no pastels); Still Life (oil and pastels). Image View: Thumbnails open in a scrollable viewer and may be downloaded. Information of medium and dimension is supplied both on the thumbnails and the enlargements. Tree Sparrow and Plum is 25 x 30 cm, 500 x 408, 55 KB.